" I am so sorry for not getting back to you sooner. When I received my Angel Ashes, everything arrived safely. 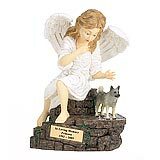 I must say my whole family and I were VERY IMPRESSED, and DEEPLY TOUCHED with this exquisite memorial to our beloved Gretel, and the acknowledgement card ---- it continues to give us great comfort, and peace. We have never seen anything presented and packaged so beautifully. Thank you for your genuine concern in dealing with such a sensitive matter." 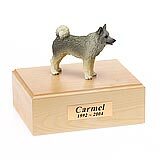 All available Norwegian Elkhound dog urns and memorials will be displayed with the figurine on the Norwegian Elkhound urn you select and in the appropriate size.